Personalized Love Couple Heart Garden Stone. Whether you're a newlywed couple or moving in with your significant other, our engraved garden stone is the perfect outdoor decor for your new home as a couple! Brighten up your garden or yard with our heart-shaped stone that has your names on it. 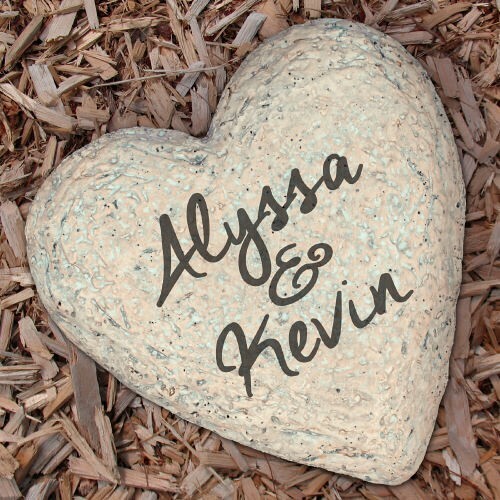 This Engraved Heart Garden Stone is made of durable resin and has a real stone look. It's lightweight, waterproof and available in 2 great sizes. Please choose either a small heart stone measuring 5.5" or a large heart stone measuring 8.5". This Garden Accent Stone is designed for indoor or outdoor use. The engraving is highly detailed and durable with color and texture variations.